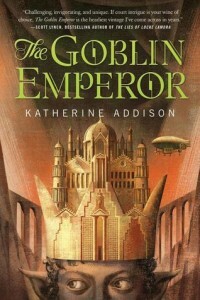 Today’s guest is fantasy author Katherine Addison! 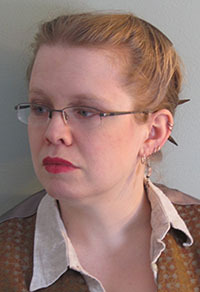 Her recently-released novel The Goblin Emperor has been receiving rave reviews, and she is also Sarah Monette, the author of Mélusine and its sequels, The Bone Key, A Companion to Wolves and The Tempering of Men (with Elizabeth Bear), and numerous short stories. I have read all the books by Sarah Monette just mentioned and enjoyed them all, but I am particularly fond of her Mélusine books, which are especially notable for the characterization and the voices of the main protagonists. In fact, they are quite easily in my five favorite speculative fiction series of all time, and my favorite book in that series (The Virtu) is one of my five favorite SFF books of all time. I am delighted to have the author of some of my favorite books here today to discuss the women in Tolkien’s books and default-male thinking in fantasy! If you look at the various blog posts, essays, and articles I’ve left scattered across the internet, you’ll see that I pick on Tolkien a lot. You might think this is because I loathe him, but the exact opposite is true. I love Tolkien. I love his stories. I passionately admire his writing. I imitate his world-building to the best of my ability. And I’m not actually picking on Tolkien qua Tolkien. I’m picking on the consequences of Tolkien, because Tolkien is one of the most admired, copied, and influential Anglophone fantasists of the twentieth century. At this point, I think that even fantasy writers who hate Tolkien, even fantasy writers who have never read Tolkien, are still in conversation with Tolkien and the way that his story and his world-building became the gold standard of the genre. There are lots of aspects to this: Tolkien’s fiercely anti-technology pastoral nostalgia, his ingrained racism, his equally ingrained adherence to a utopian version of the class structure of pre-World War I England. But I want to talk about his women, and the models they do (or don’t) provide for girls and women who want to imagine their own place in fantasy. There are no women in The Hobbit. Full stop. But The Lord of the Rings has arguably the bare minimum necessary to acknowledge that women do exist and are not, like the Ent-wives, an absence at the heart of the men’s tragedy. Each of these women represents one of the archetypal niches in which women can be installed in patriarchal fiction. Lobelia Sackville-Baggins (who–give credit where credit is due–is an intensely memorable, believable, and ultimately even empathizable character) is the Shrew, the comic horror, both monstrous and trivial, from whom men hide. Arwen Evenstar is the Beloved, barely visible and so idealized that (unlike Lobelia) she has no character at all. Even in the Appendices, she merely paces out the measures of a Petrarchan courtship, and her great contribution to the war against Sauron is to make Aragorn a deeply meaningful flag. Galadriel is magnificent, but she’s also so far above the plane of our viewpoint characters, so idealized, that the only reaction they can have to her is worship. If Arwen is Petrarch’s Laura, Galadriel is Dante’s Beatrice. She is the beloved in the courtly love tradition. Her knights may wear her favor (the clasps of their cloaks, the strand of her hair that Gimli begs), but that’s as close as they’re ever going to come. Where Lobelia is the Shrew and Arwen is the Beloved, Galadriel is the Goddess. And then she gets shunted aside again, stuck in the Houses of Healing while the forces of darkness are defeated, turned from a shieldmaiden into a healer and married off to Faramir who here, as in so many other places, is serving as Aragorn Lite. Honorary Boydom revoked with a vengeance. Then the heart of Eowyn changed, or else at last she understood it. And suddenly her winter passed, and the sun shone on her. “I stand in Minas Anor, the Tower of the Sun,” she said; “and behold! the Shadow has departed! I will be a shieldmaiden no longer, nor vie with the great Riders, nor take joy only in the songs of slaying. I will be a healer, and love all things that grow and are not barren.” And again she looked at Faramir. “No longer do I desire to be a queen,” she said. This can be read as a genuine moment on the Road to Damascus, where the scales fall from her eyes and she realizes that she has been lying to herself. Or it can be a recognition–and a relief–that she can never be the best, never be a queen, and therefore she should take the happiness that is offered to her. Or, if you think that the Eowyn we have seen in The Two Towers and The Return of the King is a hawk who can be caged but not tamed, this moment is Tolkien tidying Eowyn and her discontent and her ambition and her fury right the hell out of the story. (I never read Eowyn as being in love with Aragorn; I read her as hungry for the power and recognition that Aragorn represents to her.) It’s literature; you can choose the interpretation you want. I’ll just observe that it’s awfully convenient for Tolkien that Eowyn decides to take what Faramir is offering. Eowyn is more, though, than an Honorary Boy, because she also offers a critique of her own world that is just as trenchant for epic fantasy today as it was when Tolkien wrote it. Aragorn doesn’t have an answer for her, either, and for all that I’m suspicious that her marriage to Faramir–as with so many marriages at the end of Anglophone novels–happens because Tolkien doesn’t know what to do with her, I respect him for understanding her well enough to let her speak, for acknowledging that she has a subject position and that it’s a lousy place to be standing. 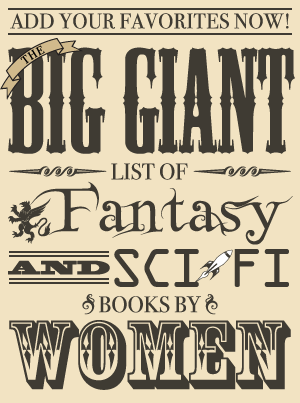 So what do you do, if you’re a woman and you love epic fantasy? If you’re not a Shrew and not a Goddess and you want to be more than just the Girl Back Home, but you don’t want to have to dress up as a boy to do it? If you agree with Eowyn that you’re tired of being good and dutiful and left behind? How do you make a place for yourself in a world to which women are largely incidental? Well, for one thing, you reject the world-view that can dismiss half the human race as “incidental.” It’s never been true, just as it’s never been true that people of non-white skin colors are animals or that people of lower economic classes are fit only for brute labor or that non-heterosexual people are evil. Real history is far far more complicated than even the most elaborately built fantasy world; there’s plenty of room. And the brilliant thing about fantasy is that you don’t have to cleave closely to historical accuracy–Tolkien certainly didn’t. The other thing you can do is to try to get away from default-male thinking. This is hard to do, and I say that as someone who fails more often than she succeeds. But it isn’t true that men can do cool things and women can’t. It isn’t true that men are interesting protagonists and women aren’t. It isn’t true that stories about men are better than stories about women. Eowyn’s only way out is to be the Honorary Boy, but that’s because she’s trapped in the world that Tolkien built, which she quite accurately describes as a cage. Imitating Tolkien isn’t the same as repeating Tolkien. We aren’t trapped in that world, and we don’t have to build worlds that are cages.